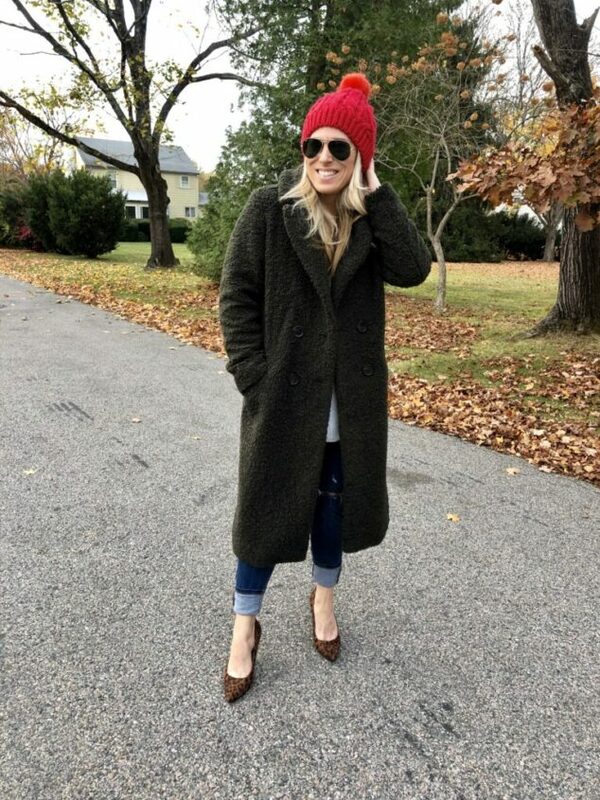 How to Style a Teddy Coat in the Winter – It’s a FASHION WIN! If you haven’t heard about this season’s hottest coat trend, you’re about to be introduced! Say HELLO to the TEDDY COAT!! We’re talking totally soft, totally comfy, totally cozy and totally fuzzy (ALL OVER!). It’s the most delicious coat to have this winter and I finally have dipped my toes into the trends fashion pool! The Teddy Coat for the winter is fantastic because it’s just WARM. That’s what you want, right? But on top of the fact that it’s warm, it’s also plush as can be!! I scored my 1st Teddy Coat from ZARA last week and I couldn’t be more in love with it! It’s not faux fur, like many Teddy Coats are – it’s PLUSH FLEECE! It’s got a really fun and soft texture and it’s my favorite color in the world – a deep green! I saw my friend Meredith rocking it on Instagram and I needed to buy it! I fell in love with it from a picture! I ordered it the next day on ZARA and when it arrived, I feel in Teddy Coat LOVE! 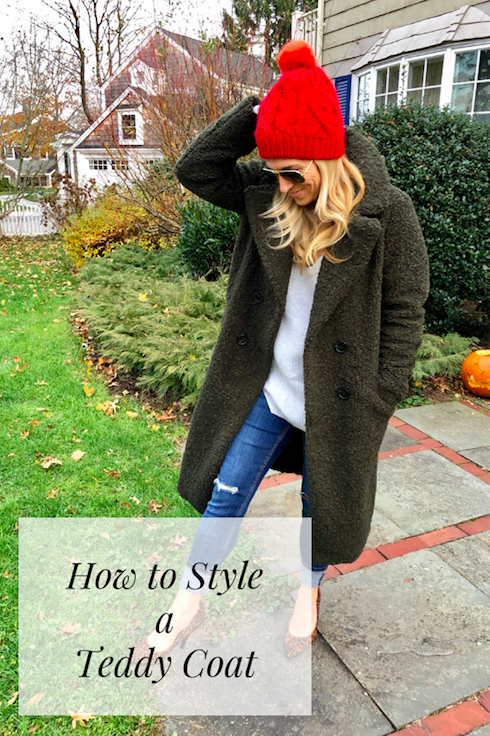 How to Style a Teddy Coat in the Winter – I’m excited to share! ZARA’s Teddy Coat for the Winter – Coat with lapel collar and long sleeves. Front welt pockets. Back vent. Contrasting front button closure. It’s everything and then some!! With it being COLD AS CAN BE in New England right now, you need to make sure you protect yourself as best as can be! Here’s the thing – I want to be warm, but I also want a jacket that is more dressier than a regular long puffer coat! When I saw this ZARA Teddy Coat, I knew it would be perfect! I can dress it up or dress it down!! I paired mine with jeans and heels and an oversized sweater! This is a go-to look for me, especially if I’m working! I love jeans with heels and a blouse and/or sweater always pairs perfectly!! 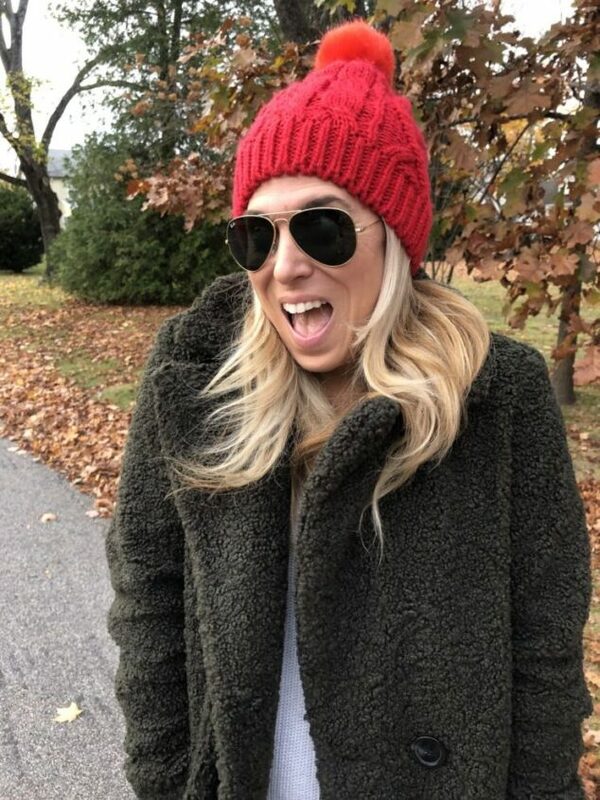 I also love a good hat, so I grabbed my fave pop of red!! This is an easy mom look, but the Teddy Coat!!?? It BRINGS IT ALL TOGETHER!! It’s just a great staple add-on for outerwear! If you’re interested in this Teddy Coat, this is a small and it fits true to size! I love it! It’s not too big and it’s not too small! Make sure you don’t go too big because you don’t want to be swimming in your Teddy Coat! 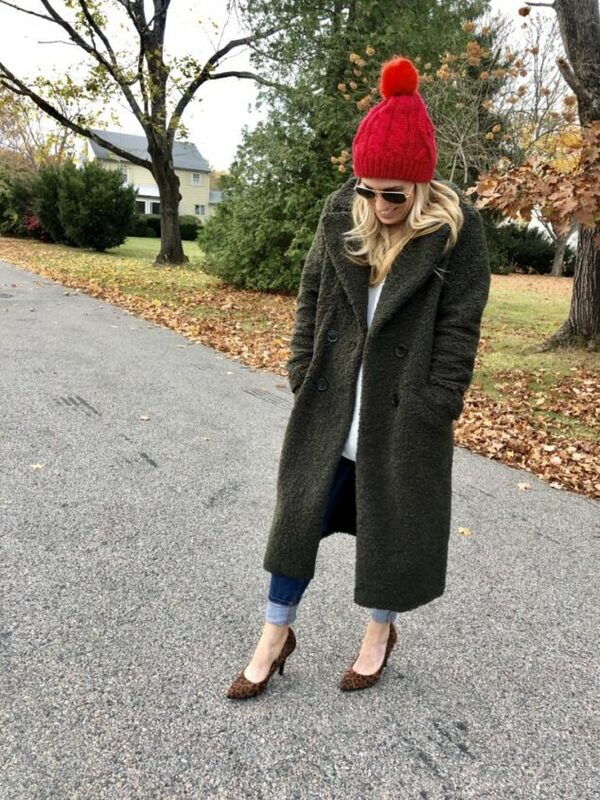 How to Style a Teddy Coat in the Winter: CAN MOMS WEAR THEM? YES. YES. And YES again! Wear it proud! What I love about a coat trend is that it’s something you can wear over and over during the season! It’s not a one-time and done type of thing! And ladies – this is the best thing since stretch pants! There are so many different Teddy Coat options out there! You can get a short one, a cropped one and a long one (like mine!). 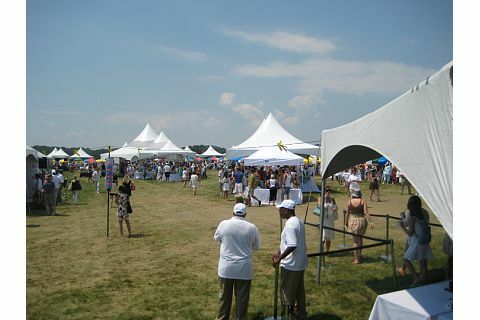 I’m including a carousel below of some fabulous options! I’m 5 feet, so this one really fits me like a long coat – but it’s probably mid-length for someone who is 5’5″ or taller! 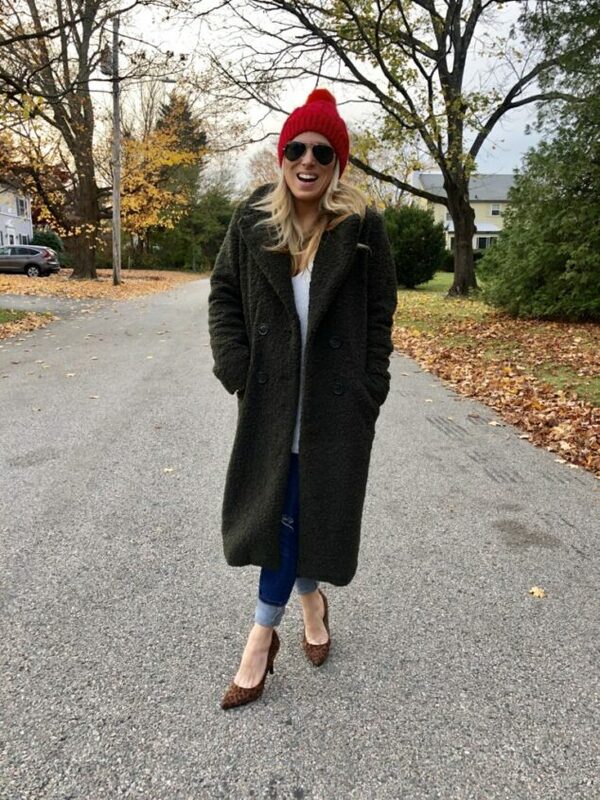 How to Style a Teddy Coat in the Winter – Check out my girl Lauren STYLING a Teddy Coat!! And don’t forget!! In the winter you can rock WHITE JEANS, too!! Here’s how you can do it!! Click here!